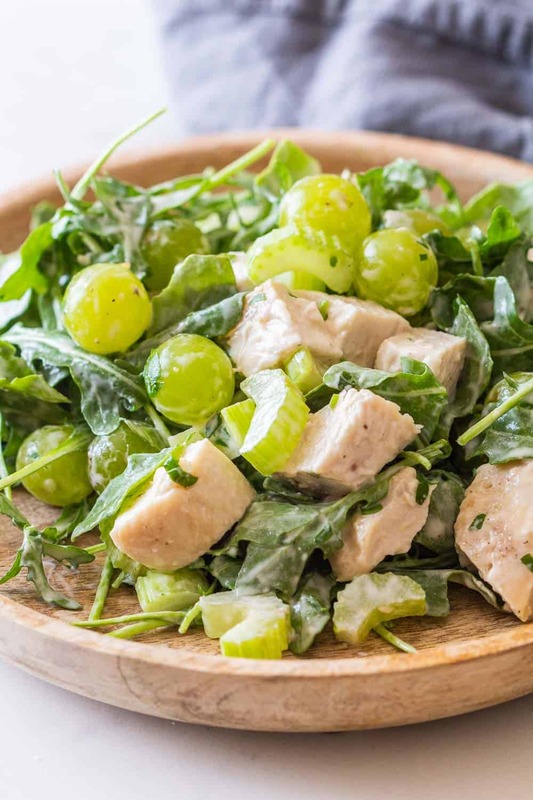 A healthy Chicken Salad with Grapes great for easy dinner as well as meal prep for the week. This salad will easily last 4 days in the fridge. Most chicken salads out there call for enormous amounts of mayonnaise. While I do believe homemade mayo isn’t that bad for us, it’s all about amounts. I love adding a little homemade mayo to my dressings, too much though and any food will lie heavy in my stomach. I tried to find the right mix here. The deliciousness of mayo but the lightness of a fresh summer salad dressing. Make a mix of mayo, mustard and greek yogurt and you get the best of all worlds. Creamy, light and incredibly flavorful. 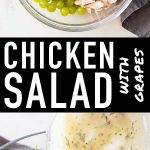 When I first heard about a Chicken Salad Recipe with Grapes I was intrigued. I was asked by a reader if I had a recipe for it on my blog. Looking into it found out it was actually “a thing” and went into the kitchen to experiment with a recipe I couldn’t really wrap my head around. There was no hit and miss this time as often with many recipes, though. I got it right the first time. Absolutely and totally in love with Chicken Salad with Grapes AND the lightened up dressing, too which can easily be poured over other salads like Avocado Tuna Salad for example. Who knew the combo of chicken salad and grapes could be so incredibly yummy? What I love most about this recipe is probably how well it can be turned into a meal prep salad. You simply need tall jars so you can layer the ingredients so the arugula doesn’t wilt. 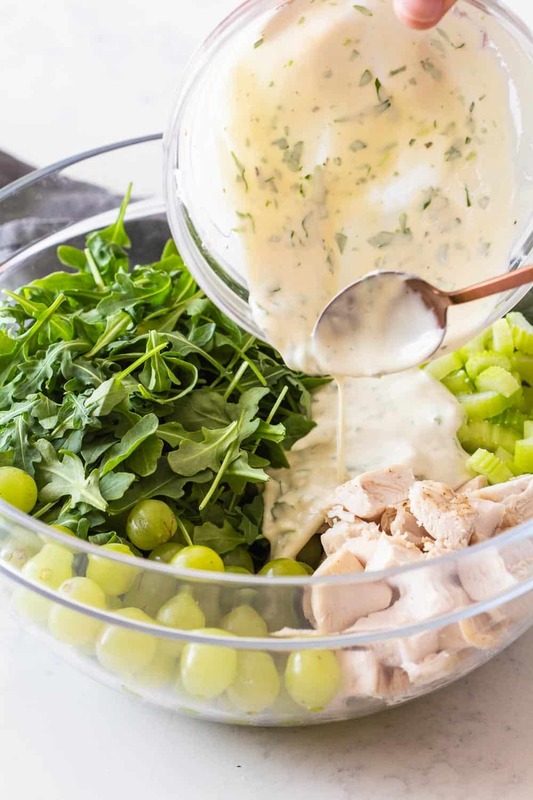 Add the dressing at the bottom, then chicken, grapes, celery and add the arugula at the top and close. Before eating just turn the jar upside down so the dressing can drizzle over all the ingredients. Shake it a bit and it’s ready to eat. Storing it like this makes it stay crunchy and yummy all prepped in the fridge for up to 4 days!! Place chicken breast on a baking sheet, drizzle with avocado oil and season with sea salt and pepper on both sides. Bake for 15-20 minutes until done (internal temperature 165F). 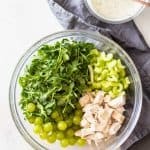 In the meantime, wash and slice celery and add to a large mixing bowl, add washed and spin dried arugula, seedless grapes and cubed chicken breast. For the dressing, add mustard, mayonnaise, Greek yogurt, sea salt, pepper, and parsley to a small bowl and whisk until well combined. Add water as needed to achieve a dressing like consistency. 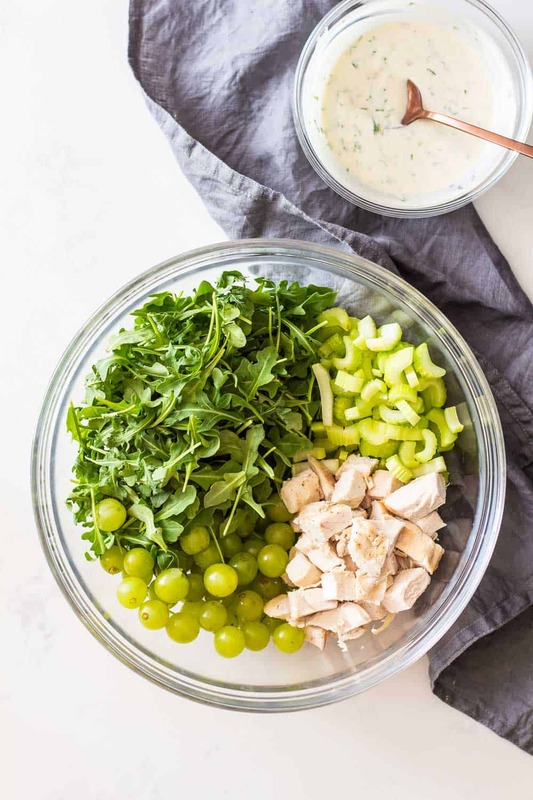 Pour dressing over salad, toss well and serve, OR add dressing to a jar, then add cubed chicken, then celery, grapes and lastly arugula. Seal and store in the refrigerator for up to 4 days.